The Figure illustrates a circuit for phase controlling a permanent magnet (PM) motor. Since PM motors are also generators, they have characteristics that make them difficult for a standard triac to commutate properly. Control of a PM motor is easily accomplished by using an alternistor triac with enhanced commutating characteristics. PM motors normally require full-wave DC rectification. Therefore, the alternistor triac controller should be connected in series with the AC input side of the rectifier bridge. 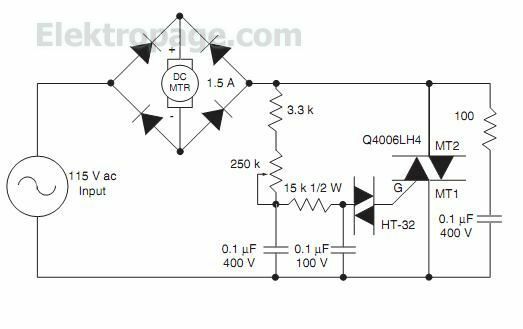 The possible alternative of putting an SCR controller in series with the motor on the DC side of the rectifier bridge can be a challenge when it comes to timing and delayed turn-on near the end of the half cycle. The alternistor triac controller shown in Figure offers a wide range control so that the alternistror triac can be triggered at a small conduction angle or low motor speed; the rectifiers and alternistors should have similar voltage ratings, with all based on line voltage and actual motor load requirements.